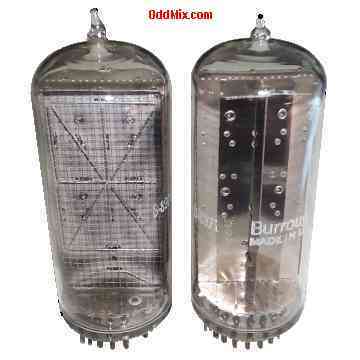 This is an original Burroughs B8971, B-8971 Nixie, long life, large size, alphanumerical indicator tube. It has sixteen cathodes. The tube emits a bright neon red color. The B8971 intended to be used vertically and it uses a 17 pin socket. Recommended operating voltage is 170 VDCmin, and 3 mA per segment typical. These original vintage tubes were made in 1968 by Burroughs ECD Division, Warren County NJ, USA for early large scale computers, binary and digital counters equipments and special circuits. Excellent for antique instrument restoration projects or to set up a private tube museum.